3 Bedroom Terraced House For Sale in Peterborough for Asking Price £160,000. 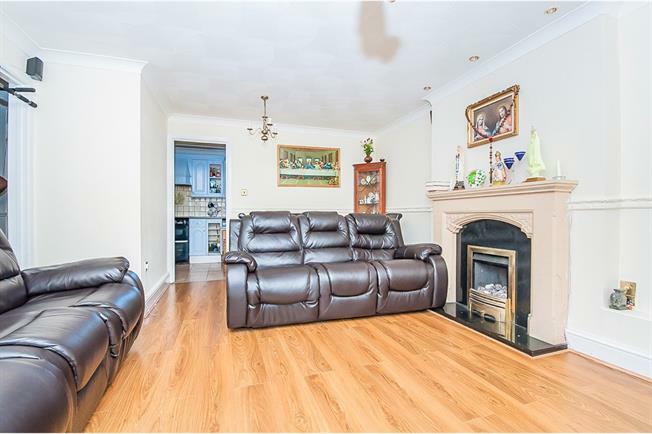 Fantastic downstairs living space with plenty of storage within, close to local amenities. Bairstow Eves are excited to offer for sale this three bedroom family home, briefly comprising of an entrance hall, downstairs WC, good size kitchen leading through to the lounge/diner and conservatory. To the first floor are two double bedrooms, further single and family bathroom. The outside benefits from a small outer building and a low maintained garden. The property benefits from two allocated parking spaces. Wooden door to the front and stairs to first floor. Close coupled WC and wash hand basin. Double glazed uPVC window facing the front, tiled floor and splashbacks, high and low level storage cupboards with worktops over, down lights, stainless steel basin with drainer and mixer tap over, plumbing for a washing machine and a radiator. Double glazed sliding doors leading to the conservatory, wood effect laminate flooring, dado rail, coving and an electric fire with surround. Of uPVC construction with a door leading to the garden. Double glazed uPVC window facing the front and a radiator. Double glazed uPVC window facing the rear and a radiator. Double glazed uPVC window facing the rear, built in storage cupboard and a radiator. Double glazed uPVC window facing the front, close coupled WC, vanity unit with basin, double shower cubical, tiled floor, tiled walls and a radiator.